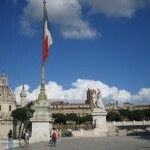 Italy has several cities, towns and villages, big and small which are well worth visiting. San Vito lo Capo and Scopello are only a few of the mentioned settlements which offer the real Italian experiences for all tourists and visitors. San Vito lo Capo can be found on the coastal region in the area of Trapani, while Scopello is a feudal village, also located on the coast between San Vito lo Capo and Castellamare del Golfo. These warm and welcoming holiday destinations are at their best between the months of March and October, but the most crowded season is definitely the summer season. 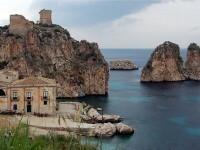 Join the crowd and visit the western region of Italy, visit San Vito lo Capo and Scopello. Saint Vitus Cape or in other name San Vito lo Capo is a charming locality situated in Trapani, on the shores of the Mediterranean Sea. Not far from town there is a reservation area called Zingaro Nature Reserve. 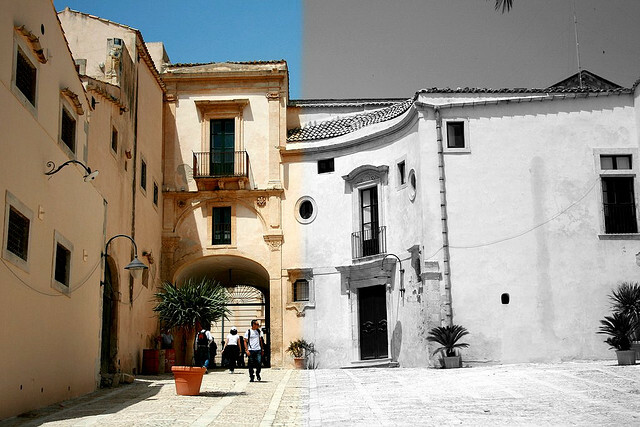 Also in the surrounding region you can visit Segesta and Erice, famous for their historical importance for Sicily. 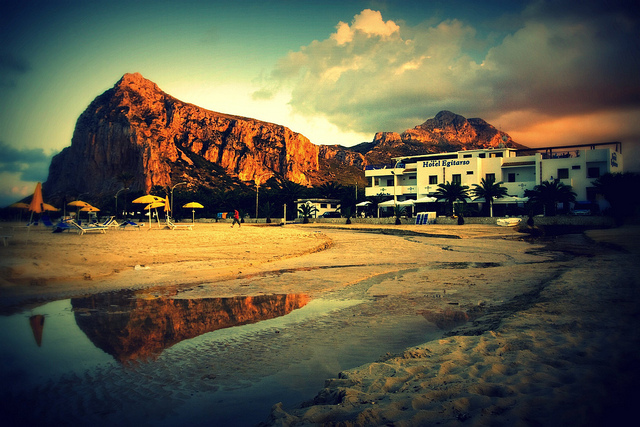 San Vito lo Capo is very popular for it couscous festival which is organized in September month every year. The festival is dedicated to a local specialty called couscous. If you have seen the movie Ocean’s Twelve you might recognize the location if you visit Scopello as some of the scenes were shot here. This little town might not be very popular among tourists but that gives the charm to it. No crowds, no noise, just a peaceful holiday. There is a fantastic public beach nearby and the nature reserve is not far either. Visit the medieval watch towers and don’t forget to find out more about the baglio. Are you looking for accommodation with a rustic touch? There are several farmhouses which you can rent. 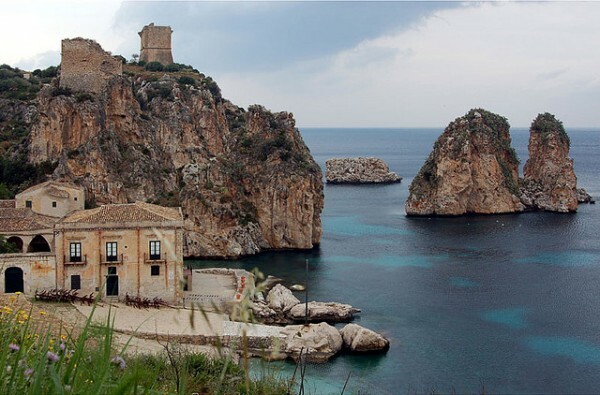 Visit Scopello and discover Italian culture and tradition. 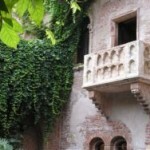 The Italian word baglio is a kind of a palisaded enclosure, part of a castle, notably its outer wall. Basically this construction is a fortified, square shaped courtyard which has a strong gate dotted with towers. In other words it’s a two-in-one castle fort. 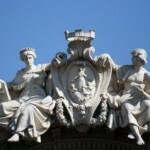 Originally baglio was invented by the Normans who evaded Sicily during the Medieval Age. Several baglios have survived during the centuries. The one at Scopello is many centuries old. Today its courtyard has a café and a restaurant. Hide away from the hot rays of the summer sun and enjoy a glass of cold refreshment inside. We also recommend you to visit the towers on the coast, which are reminders of the Norman and Saracen times, when they dominated Sicily.